Coral are a complex mix of animal and plant life. The small animals that make up the coral are related to jellyfish and anemones and are called polyps. The microscopic forms of plants called algae that live within the coral are called zooxanthellae. Most coral is made up of many individual polyps connected by living tissue. Each polyp has a cuplike shape with a ring of tentacles around a central opening. These are tipped with stinging cells used for defence and for catching zooplankton for food. The polyps also secrete calcium carbonate (limestone), which forma the basis of the coral reef. Over the last 25 million years coral have evolved into reef-building forms. Although coral reefs cover less than 0.2% of the ocean bed, they contain more than 25% of all marine life. Only rainforests provide homes for more species of animal and plant life and as a result coral reefs have become known as the ''rainforests'' of the ocean. They are ecologically important ecosystems, with a high biodiversity that serves as a storage bank of rich genetic resources. They are a source of food and medicine and reefs protect the coast from wave erosion. There are two main types of coral: hard coral, which is the major reef-building species and soft coral such as sea whips and fans. Not all coral produce reefs and those that do are called hermatypic. Coral reefs are classified into three types: barrier reefs, fringing reefs and atolls. Barrier reefs are offshore and are separated from the mainland by water. Fringing reefs are continuous with the land mass, and atolls are coral islands surrounding a central lagoon. Coral requires temperatures ranging between 16° and 30° Celsius (61° to 86° Fahrenheit), so coral reefs are generally found in areas roughly 30° north or south of the Equator. Ideal conditions for reef development are clean, clear, tropical waters that are relatively shallow, have a stable warm temperature, are low in nutrients (like phosphorus and nitrogen) and have an even salt content. The small zooxanthellae algae use light energy to convert water and carbon dioxide into food in a process known as photosynthesis. Coral polyps get much of their energy from this photosynthesis. In return the algae have a safe place to live within the coral tissue and the coral's waste provides a ready source of food. This type of arrangement where both organisms live together to mutual benefit is known as mutualistic symbiosis. It is the zooxanthellae that give the coral its colour. If this mutualistic symbiosis were to break down, coral bleaching would result. Any form of pollution can cause the coral to become stressed and this sets off an environmental trigger that affects the coral's ability to supply the zooxanthellae with nutrients for photosynthesis. This sets off a downward spiral with the coral unable to prevent the division of the zooxanthellae, leading to even greater amounts of photosynthesis-derived carbon being diverted into the algae rather than the coral. The fragile balance can no longer be sustained and the coral tends to expel the zooxanthellae and takes on a lighter or bleached appearance. Coral reefs are in danger. Pollution is the greatest enemy. Some experts say that 10% of the world's reefs have already been destroyed and another 60% are in danger. It is predicted that Australia's Great Barrier Reef could be gone within 40 years if the present level of CO2 emission into the Earth's atmosphere should continue. Coral reefs provide a food source and a living for many people, especially in the developing world. 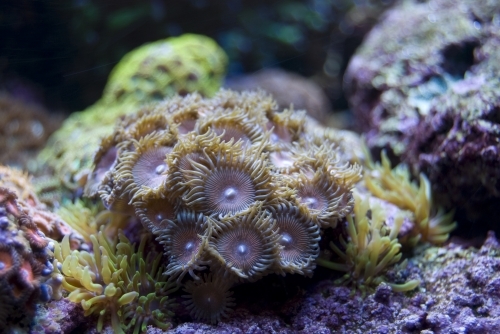 Anti-cancer drugs and painkillers have been developed from coral reef products. Current research is looking at methods of encouraging bone growth in humans in the same way that coral secretes limestone. Additionally coral reefs have an important role in the world's carbon cycle. Coral reefs are an important feature of the world's environment. They come with a number of benefits, but their future will continue to be in doubt if they are not treated with the respect that they deserve.